When Keith Jackson was created, they threw the mold away. 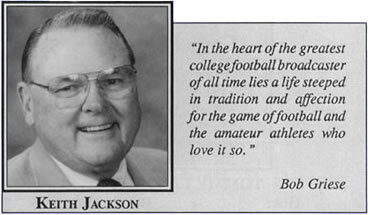 Imitations abound, but there is only one Keith Jackson. Highly respected and admired by his colleagues in both the broadcast and sports press, Keith Jackson is a product of his roots and early experiences. Born in Georgia, Keith grew up picking cotton and plowing fields, and studying by kerosene lamp. Determined and focused on his goals, Keith entered Washington State University on the G.I. Bill of Rights. From KOMO-TV, Seattle, where he found a job upon graduation doing the evening news and doubling as a sportscaster, Keith Jackson went on to become one of the greats in the field. He made history in 1958 with the first live broadcast of a sporting event(crew) from the Soviet Union to the U.S.
Jackson served as play-by-play announcer for ABC's coverage of college football for over 30 years before retiring after the 1998-1999 season. His partnership with college sports, connecting the broadcasting booth to the campus, is a near perfect match. Keith's long and illustrious career, marked by numerous awards, covers a variety of sports such as NCAA Basketball championships, major league baseball, boxing and championship auto racing. Throughout his sportscasting career, spanning 31 different countries, his simple broadcast philosophy prevails--"Amplify, Clarify and Punctuate and let the viewer draw his or her own conclusion."